Le Club AccorHotels has launched a new bonus points promotion for minimum two night stay in France between September 1 – November 5, 2017. Members can earn 750 bonus points one time during the promotional period IF the booking is made between August 8 – September 3. Some bonus points for those that stay in Accor’s home turf late summer/fall. Le Club AccorHotels tends not to run that many promotions in France due to being dominant player in the market. 1. General terms and conditions The AccorHotels Club apply to the offer Go out of the way and become a champion! And you must be a member of the AccorHotels Club in order to benefit from it. 2. This offer allows members of the Club AccorHotels, regardless of their status, to benefit from a bonus of 750 Rewards points (equivalent to 15 €) for a minimum stay of 2 nights in one of the participating hotels Fidelity The Club AccorHotels in France. This Rewards points bonus comes in addition to the Rewards Points and Status Points normally earned by the member for an eligible stay under the terms and conditions of the Le Club AccorHotels program. 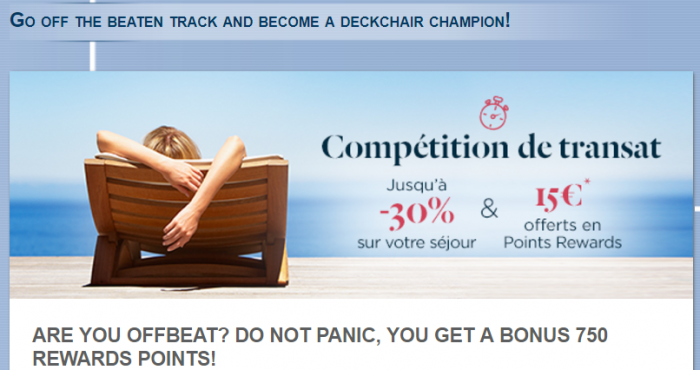 This promotion does not apply to stays in partner hotels of the Le Club AccorHotels program. The number of Rewards points for this offer is calculated based on the points earned by the member based on the Classic status. 3. This offer is valid for any stay of a member from 01/09/2017 to 05/11/2017 in one of the participating hotels in France and booked between 07/08/2017 and 09/03/2017. 5. Any consecutive stay (arrival and departure on the same day) in the same hotel will be considered as a single stay. This unique stay will be eligible only once for the offer Take off and become champion of deckchair. 6. For the purposes of this offer, a stay represents one (1) reservation made by a member of the AccorHotels Club for one or more rooms in a participating hotel. To avoid doubt, a reservation made for more than one room will therefore be considered as one (1) stay. 7. To take advantage of this offer, your reservation must be made on AccorHotels.com, the websites and applications of our participating brands and via the AccorHotels call centers. No other reservation channel will be eligible for this offer. 8. You must provide your AccorHotels Club card number when booking and present your card at the hotel reception when you check in. 9. Rewards Points The AccorHotels Club are credited to the member’s account within 10 days of the end of their stay. 10. This offer is not cumulative with other promotional offers or promotional offers and does not apply to groups. If your stay meets the requirements of several offers, only the Rewards points of the most generous offer (ie, allowing you to earn the most Rewards points) will be credited to you. 11. Any stay paid in full or in part with Rewards Points or with one or more vouchers The Club AccorHotels can not be eligible for this offer and can not be included in the trip counter related to the offer. 12. This offer is subject to availability. The general conditions of sale apply for the reserved public rates specific to each hotel. To be eligible for this offer, you must register for the Off-the-Shore Offer and become a Transatlantic Champion! Prior to making the reservation.